Also Try: "The Host" or "Haeundae"
Many happily look back at contemporary disaster films such as JK Youn's "Haeundae", Bong Jong-ho's "The Host", and to a lesser and different degree, Kim Ji-hoon's monster "Sector 7", as films that pushed the scale and scope of what was possible for the genre. Biological or otherwise, "Deranged" teases with the boundaries of traditional disaster films, superimposing a refreshing sociopsychological element through its solid dramatic filter of fatherly duty and the 'golden mean' approach to social responsibility. Kim Myung-min plays Jae-hyeok, a man who makes daily sacrifices in service of his family and their wellbeing. He is initially stern, cold almost, and constantly scolds his ditsy and naive wife (Moon Jung-hee as Kyeong-soon) and their two children (a daughter and son played by Yeom Hyun-seo and Uhm Ji-sung) for their apparent sloppy behaviour. Stressed and overworked, Jae-hyeok's endurance is put to the test as a suspicious and deadly virus begins to wreak havoc across the city, as well as within the family he strives so hard to protect and support. The mysterious infection causes its victims to seek out copious amounts of water in an attempt to quell the un-quenchable thirst it causes. Eventually, feelings of dehydration are replaced, strangely only at night, by a maddening urge to completely submerge one's self in water- ultimately drowning the infected and leaving their bodies severely deprived of all moisture. 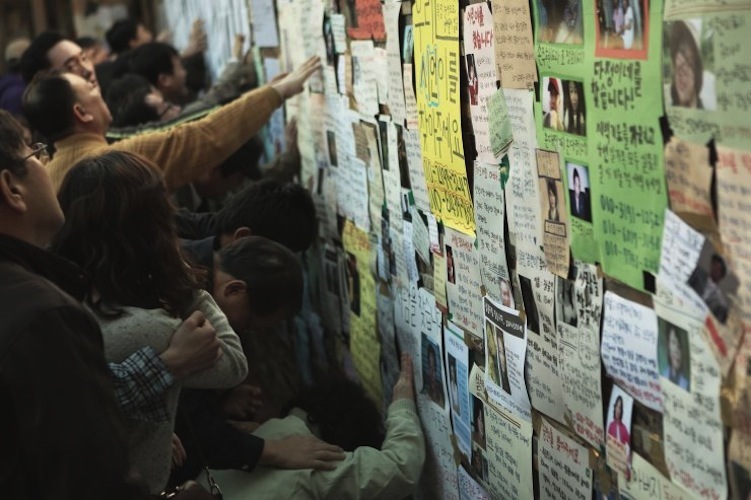 "Deranged" captured the pandemonium of a Korean city in crisis. Its residents are thrown into a frenzy and hoards of panicked people are seen struggling in a number of choice scenes and locations. 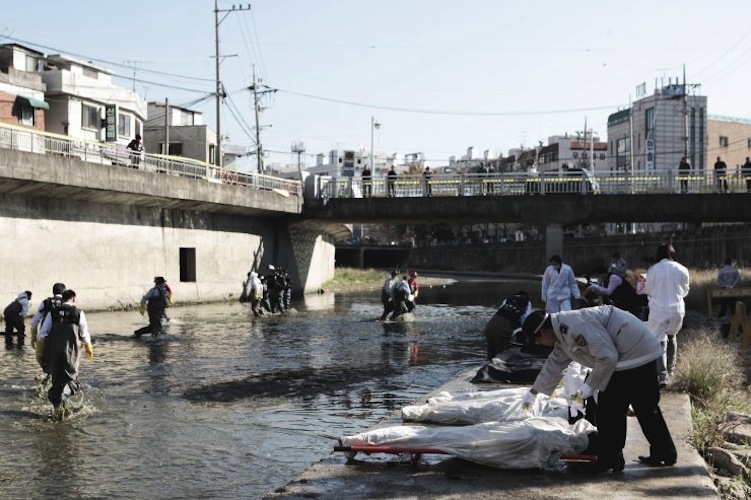 One woman, for example, in an attempt to satisfy her sickness for excessive hydration dives head first into one of the many fish tanks that line Korea's streets. Pharmacies and hospitals are overrun with fearful and desperate citizens seeking the magical cure that is in seriously short supply. But among the madness we follow Jae-hyeok as he, similar to the infected, struggles to satisfy his unwavering desire to save his family by locating the 'silver-bullet' capsules that would spare his family. It's an interesting situation as we have the infected mindlessly obsessed with drinking and diving into water (not dissimilar from a zombie craving brains it must be said), and the uninfected furiously fighting to find the cure in cut-throat crowds around the city-each have their 'need' and will go to almost any length to succeed. As his wife and children chug water with other infected families in a school gym, Jae-hyeok is trying to secure the drug they need to avoid a painful death. His efforts leave him, on quite a few occasions, frustratingly close but the pills he needs are continually and tragically wrenched from his desperate grip. In addition to Jae-hyeok's desperate attempt to acquire the required drugs, the film also follows his brother Jae-pil (Kim Dong-wan), a policeman who follows the breadcrumbs of the infection to uncover what looks increasingly like a bigger conspiracy being played by powerful corporate entities. Here we find two dimensions to the story that are almost self-contained as the script seemingly demanded more meat and breadth than what Jae-Hyeok's character could provide. By making it the brother's concern to follow the conspiracy and Jae-Hyeok's his family, "Deranged" creates two separate journeys through this disaster. I can't help but believe that the brothers' roles could have been condensed into a single, perhaps then more robust, character. Similarly, his wife and children were soft and unable (but not due to a lack of effort) to shed the one-dimensional characterisations they were introduced with. Relationships, in general, seemed to be stretched thin and, as a result, they lacked real story value outside of simple narrative convenience. Paper-thin families or not, this is a film about a father who has a duty, a desire and an unquestionable personal commitment to protect them without fail. "Deranged" is a refreshing and unique take on the disaster genre. Jae-hyeok's desperation was clearly felt and the chaos that surrounds and engulfs him is soaked in enough suspense to keep you locked into your seat. Director Park Jeong-woo captured the madness of the pandemic excellently and exploited a number of interesting Korean icons (both of persons and place) to accentuate the immediacy of the threat with its contemporary setting. Themes of patriarchy, duty, and honour are intelligently balanced between the intimacy of the nuclear family and the cold corruption and power of big business. It's not as well polished as one would've hoped for, and there were a few saturated clichés and evidence of lazy writing. But overall, Park Jeong-woo's third film is an exciting refresh on the Korean disaster genre that should cause you to re-examine some topical social issues and concerns of our generation. * Christopher is a film writer and a graduate arts student at the University of Cape Town in South Africa. He lived and worked in South Korea for four years and there he channelled his passion for film into the Korean cinema scene. Driven by his rampant cinephilic needs and Korea's vibrant cinema, Chris now enjoys watching Korean films and writing about what he thinks of them.